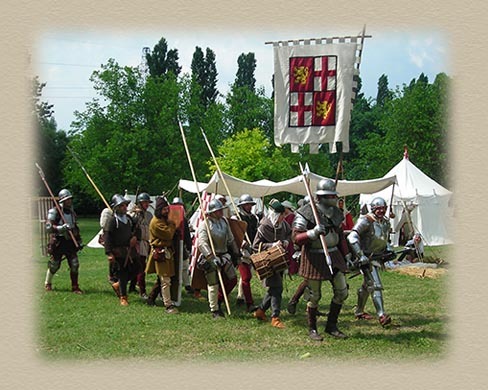 Compagnia del Fiore d'Argento is a cultural-sport Association born by the fusion of two different groups - Compagnia degli Arcieri del Fiore d'Argento and Compagnia di S.Procolo - but with a common interest: the historical re-enacting. The common goal of all the associates is to develop an accurate, reliable and faithful level of historical re-enactment, through a contuinuing research of written and iconographic documentations which carries inequivocable evidences. Researches led by our associates allowed us to build an accurate and realiable archive, full of images and texts, which brought the Association to an almost precise level of historical re-enacting, as well as the collaboration with some accredited historians and museums. Quality and care requested to the associates, in their role of medieval re-enactors, is strict, but it's structured for a progressive and pertinent development based on the historical periods re-enacted. Actually the Association is re-enacting two historical periods: Medieval and Celtic.